i'm moving my blog - it's a bit bittersweet! this has been my blog home through many seasons but a new time is here, baby is almost here and it's time. please come visit me at goldiestereo.com ! This is one of the best quotes I've ever read regarding motherhood and I hope can remember it on days that are hard, when kids are screaming and laundry and dishes are piled high. Motherhood is the most amazing thing I have ever taken part in. It's definitely hard sometimes, but I want to think of it as empowering rather than restricting. I don't want to think of my kids as a ball and chain. I think motherhood provides a billion opportunities to do, to learn, and to create. - Cheri Heaton of I Am Momma Hear Me Roar . last week we went on vacation with my husband's family to disney world. it was amazing. definitely one of the best vacations i've ever been on. i guess the best part of going to disney world as an adult with no children (yet) is all the nostalgia. i had not been back since i was 13 to the magic kingdom and probably since i was 10 to epcot. it was my first visit to the animal kingdom and hollywood studios. visually i couldn't get enough of "it's a small world", the colors and the art design had me captivated. i loved going to the carousel of progress and being instantly transported to being there as a child. i love every detail i could find anywhere that they have kept the same all these years and enjoyed the new rides while lamenting the loss of "mr toad's wild ride" and "if you had wings". the place is truly magical. it's unbelievable the pains they go through to take care of every last detail. even the quick service food was really good. epcot is probably my favorite, where you can go globetrotting in a day and then travel to the future. i loved shopping in the stores and bought my first presents for our little girl in japan and the united kingdom. nathan stole my heart when he came back with a toy he found for her on his own. we had so much fun together remembering so many things we enjoyed as children there. it was so sweet to dream together of the day we can take our little girl there. 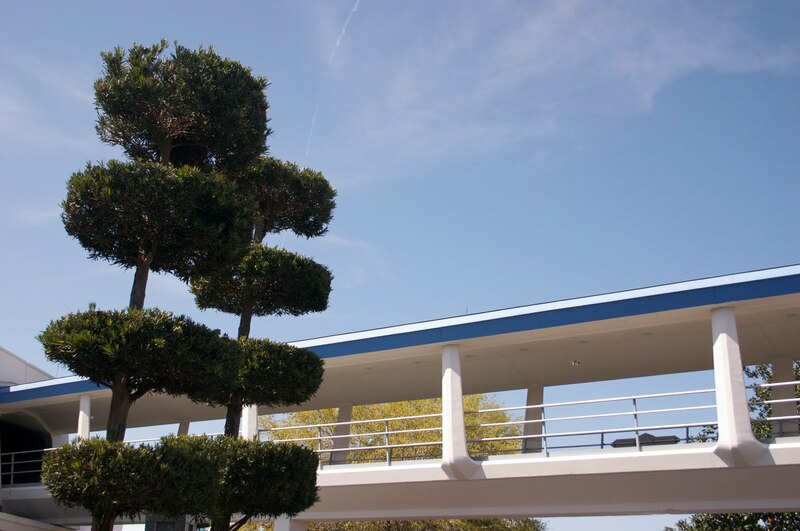 for a lover of mid century modern - there are many treasures to be found in the magic kingdom, epcot and hollywood studios. we ate at a diner that was decorated like a 50's kitchen with all the kitschy decor to match. the fried chicken was good but mostly i loved just looking at the decor and pretending to be transported in time. 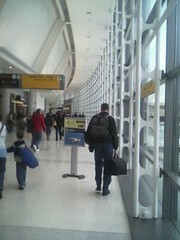 going to florida always makes me nostalgic as well, since i lived there three times as a kid. it makes me homesick every time. swimming, sunshine, great food, rides (even ones for expectant mommies), bits of mid century modern design, childhood memories, hanging out with the love of my life, laughter...it doesn't get much better than this. after living in ohio for 16 years (wow, that's unreal) i have finally found a really good mexican restaurant. a random google search for an italian restaurant actually lead me to a page of glowing reviews for this place, each one better than the last and declaring it authentic and hard to believe there was a place this good in ohio. we decided to try it yesterday. nathan had authentic taqueria style tacos this past year and has been on the search for places here that have them. the best part is this place is very close to where we live so we went for lunch yesterday. the decor is colorful and lively without being tacky, it's fun. 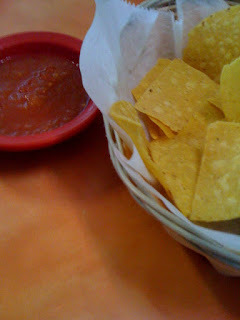 we were seated promptly and served a basket of warm tortilla chips and a really tasty salsa. simple but good. the menu is expansive, from chorizo and eggs or even pancakes for breakfast to ceviche and tortas. the non-alcoholic beverage selection was impressive as well (they serve Coca-Cola not Pepsi which is always a plus in our book!) with mexican soda like Jarritos and Aqua Fresca and something called "The Rusa" which I had to try. 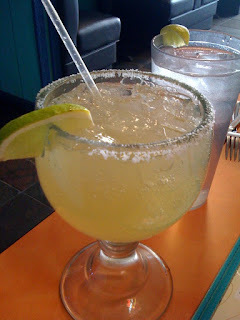 It was served in a large margarita glass rimmed with salt and contained the citrus soft drink Squirt mixed with a liberal amount of lime juice and served over ice. Heaven in a glass! Since I've been expecting I crave lime beverages (limeade mixed with club soda) like crazy and this was pure heaven for me. So much so i promptly went to the grocery store and bought the ingredients to make it myself. i can't wait to try the aqua frescas some hot summer day! 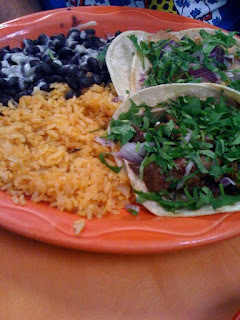 nathan orderd the beef tacos with a nice portion of delicious steak topped with onions and cilantro on a corn tortilla. 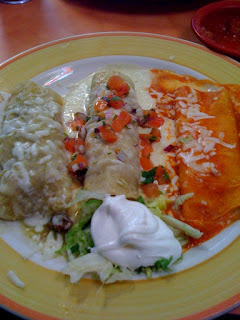 i ordered the tri color enchildas: One beef enchilada with salsa verde, one chicken enchilada with cheese sauce and one cheese enchilada with salsa roja, garnished with lettuce and sour cream. it was the most delicious cheese enchilada i've ever had. we both enjoyed every bite of our food. needless to say......we will be back. great food and not too expensive either. delish! my sweet mother whose birthday just happens to be valentines day is making the sweetest gift baskets! she even has a little blog. i wish christmas would last until valentines day. would it be so awful if i left up my tree for most of january? is it any different than my friends who put theirs up before thanksgiving? we are having a lovely christmas. 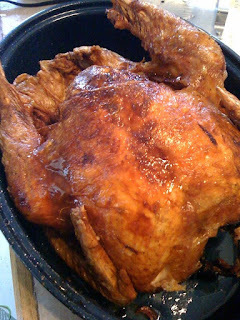 we went to georgia and enjoyed time with my mother's family where we had southern deep fried turkey, senator russell sweet potatoes, cornbread dressing and all the other fixings. it was so lovely. i stood outside and breathed in the georgia air and it felt like home. we also went to my grandmothers where we had honey baked home and the most delicious melt in your mouth rolls made by my aunt made from butter, butter and more butter. we even got to stop by to see one of my very oldest and dearest friends at her new restaurant in lagrange, ga called "low country" featuring "coastal southern cuisine". they redecorated and renovated an old victorian house and made it beautiful with a blend of pottery barn modern and a touch of nautical. then there's the food.......coca cola in the bottle, sweet tea, hand battered fried chicken, bourbon pecan pie. mouth wateringly good food at a reasonable price. so as you can see we ate our way through christmas and it's not over yet. we are home now. 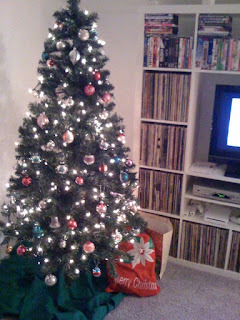 the tree is lit and the vintage ornaments shine and make this room so cozy. there's dinner in the oven to be taken to friends with a brandy new baby. there's a pancake breakfast to be made in the morning with another very special friend who just got engaged. then a new years party with music and friends. new years day will bring our christmas celebration with my husband's side of the family. then we get to bask in the glow of it all and enjoy the snow and so many reasons to be thankful. joyous news:: a tiny little baby is growing and we are expecting him or her to arrive in july! it's exciting, scary and wonderful all at once. we have to trust God and His timing and just put it all in His hands. we sure do love this baby already though and hopefully that's a good start. newsy news:: my husband is going to OSU in january to become a school teacher! i'm so excited for him. he loves computers and showing people how to use them so he is going to be a high school vocational computer teacher. living news:: i love our new apartment! i love it! it feels like home and that is a very good feeling indeed. 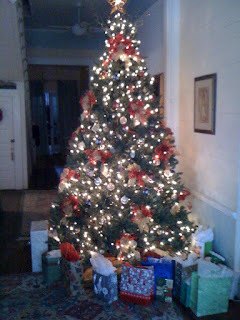 christmas news:: i have a couple gifts crossed off my list, none wrapped, a tree up, stockings hung and lots left to do. christmas cards may not get sent this year. my energy gets zapped pretty quick but i'll just save them for next year. holiday kitchen news:: i made some christmasy chocolate covered pretzels and i plan to make these and nathan made this and i would like to try these . that's all i've got for now. happy holidays to you and yours! happily married to my best friend.